You know those days when you get on the bike and your like, “ooohh I’ve got good legs today”. That was this morning warming up for the world Championships. I arrived in Scotland on Tuesday after a couple days and a race in Switzerland. We’ve been staying at this great hotel and have been completely taken care of so I was able to completely indulge in resting my legs. Yes I did get a little stir crazy at times, but got some good reading in. All the Canadians were feeling that the course was awesome. Although it was a little over constructed with all the corners being burmed, it was really fast and fun. I was also pleased to find a 10 minute climb to stretch my legs on, knowing that even in a world cup field I’m one of the strongest climbers. So it’s Saturday morning and my legs are feeling awesome. It’s overcast, but dry and I have a fun course ahead of me and a third row call up. Off the start Petra Henzi and a woman from the Netherlands crashed, but I was able to avoid the downed riders and tried to move up. I had a good start, but wasn't really able to move up until about 2km as the pace was fast. After that I cranked it up a notch and passed a ton of fast girls. Georgia Gould and Rosara Joseph grabbed my wheel. By the top of the first climb we were in the top 10 with a Polish girl in front. I reeled her in steadily with Rosara urging me to pass her as she was slowing us down. We eventually got by and on the flat I bridged up to the lead 4 women who were playing cat and mouse and letting Marie Helene sit up front. I briefly thought about taking over pulling, but quickly reminded myself this was the first time I’ve ridden up front so I should probably not be pulling WC winners around the track on lap 1. Heading out into lap2 we have to climb up this rock face type deal. A lot of riders were struggling with it –men and women- and the two girls in front of me messed it up and forced me off the bike, but I was quickly back on. Sabine was just in front of me, but had the gas to burst back to the lead 3 where I had to try to steadily bring them in. On the climb lap 2 I guess the Chinese rider Jing Jing attacked forcing the pace and opening on me and dropping Marie. I bridged up to Marie mid lap 2 hoping that together we could ride faster and reel the women in, but she was setting her own pace and I opened up on her. Pretty cool. I had secret hopes of a top 5, but to be riding in 4th ahead of Marie was pretty cool. From there I was alone until the end of lap 3. Athough I wasn’t making mistakes on the descent, between the flats and burmed corners Marie and Rosara were finding some time on me. By the start of lap 4 they were on my wheel. My legs started hurting pretty good on lap 3, and lap 4 was no different. I was hoping to be able to pull something special out for that last climb, but my legs were the limiter. At about 1/3 of the way up the climb Marie and Rosara passed me. Marie stormed away while Rosara and I battled back and forth for position. Rosara eventually claimed the lead going into the descent. Both women pulled away from me that lap and I rode in still very ecstatic with 6th. Wahooo!!!!! Marrie finished in 4th and Kiara in 11th. Great rides all round. Thanks so much to everyone that has supported me this year. Keith, mom, dad, Geoff, Grandma, Norco, Dan. Thanks also to everyone that believed in me and my ability to get a top 10 at Worlds. Hopefully it’ll just keep getting better! 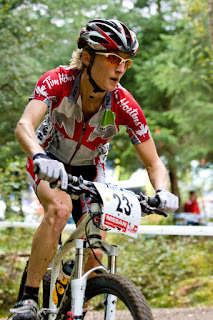 I'm off to cheer on norco Team mate Fion tomorrow in the DH as well as the Canadian DH'ers. The Best Western GlenSpean was our home for the week. 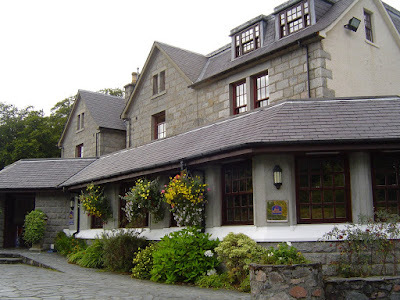 It's a great hotel about 15km past Fort William. We looked out at lush rolling hills and our hosts Suzanne and Ian were amazing. I'm sure they celebrated our departure with some good beer. The good Scotch was to get through the week. Fantastic race at Worlds Catherine! Congratulations,what a great season your having! Thanks for giving us someone to cheer for. Congratulations for your 6th place. If you travel to Australia let me know because I'm here working for the next 6 month, then back to Chile.